← Stewed chicken. Santo Domingo Style! 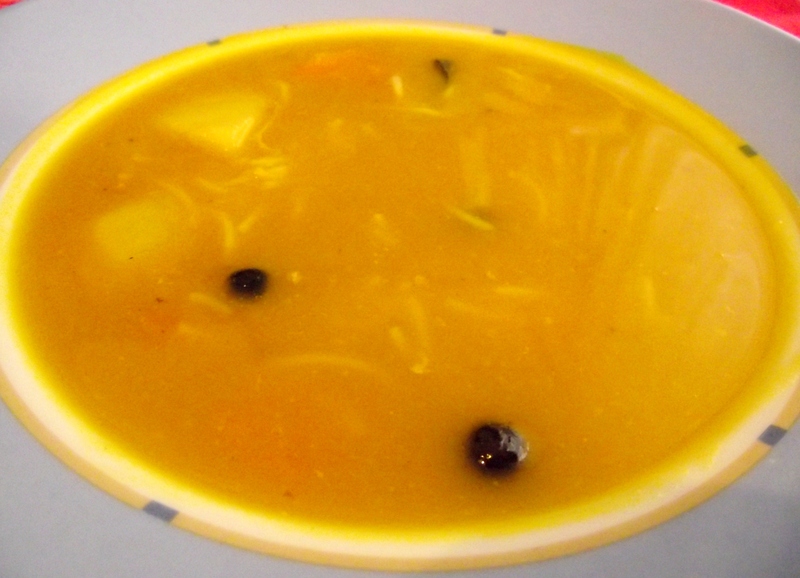 Chicken soup is one of the most popular recipes in the western world. Nothing like a chicken soup in a fresh and cloudy day. Is there something more comforting than a chicken soup when we are in bed with a flu? Who doesn’t remember a chicken prepared by mom or grandma as a child? Today I share a recipe inspired in Mrs. Anadina’s (my mother in law and third Mother) hearty soups. She prepares the best broths that I have tasted. Always creamy and delicious. 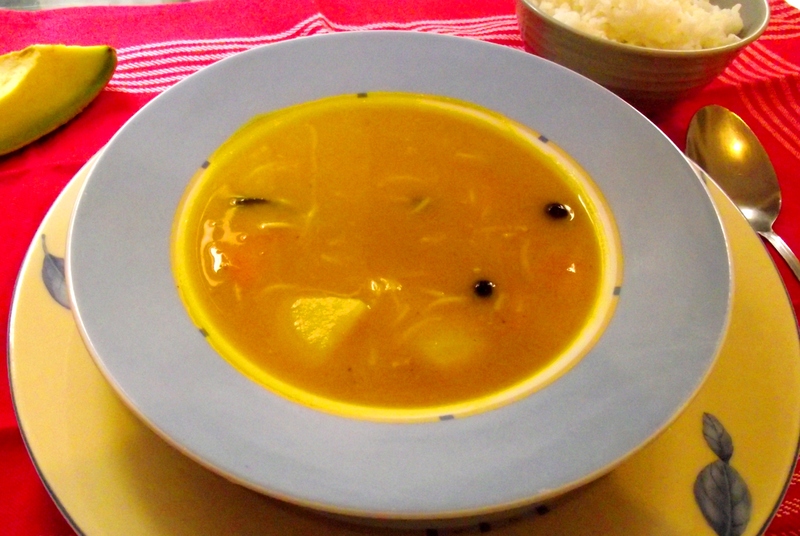 Today is rainy in Santo Domingo, so this recipe fits nicely! ” 3 potatoes cut in squares. ” 2 carrots, cut in squares..
” 3 rolls of noodles. ” 1 bush of cilantro. ” 1 spoonful of malagueta pepper pellets. Add a little bit of oil to a boiler and when hot toss the cilantro, garlic and bouillon cube. Allow 30 seconds and add some 3 cups of water and allow to boil. When it boils add the chicken (not the breasts) then allow to boil for about 15-20 minutes. Add the potatoes, the carrots, the chicken breasts, a roll of noodles (break it up well with the hands) and the malagueta pepper pellets and allow the potatoes and carrots to get soft. When the potatoes and carrots are ready add the pumpkin cream and the two remaining rolls of noodles. When the noodles are ready, rectify the salt and enjoy! This entry was posted in Soups and crémes, Traditional Dominican Food and tagged borinqueño, caribbean, caribeña, chicken soup, chicken soup for the soul, chicken soup recipe, colombia, colombian, colombiano, comida dominicana, cuba, cubano, dominican, dominican chicken soup, dominican food, Dominican food at el fogoncito, Dominicana, El Fogoncito in English, el fogoncito.net, elfogoncito.com, organic food, puerto rican, puerto rico, quisqueyana, recipes, venezolano, Venezuela, venezuelan. Bookmark the permalink. 4 Responses to Chicken Soup. Dominican style. Pumpkim cream? Can you explain? Hi Sairamar! Sure (2 cups of pumpkin cream. (Just boil the pumpkin with some salt and blend it in its own water, a squirt of milk and a bouillon cube) that’s Dominican pumpkin though, which is similar to squash. Thanks for your comment! Yes, you may have it as a thicker soup. As a creamy soup you may have it as a stand-alone dish.